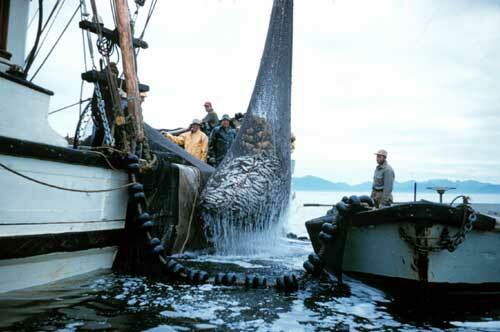 "Biologists have privately stated that that they are against this [sac roe] fishery. that ignores history, ignores facts." from Andy Rauwolf and John Harrington. In general, not many people are interested in herring. It's not exactly a glamour fish. You won't see a snapshot of a grinning fishermen posing for the camera while holding up a trophy eight-inch goggle-eyed herring by the tail. And when was the last time you had baked, fried, roasted, grilled or pickled herring? The only time most people come in contact with herring is when they skewer a chunk of it onto a hook for bait when salmon fishing. But that small, now-disregarded fish has always been of great importance to the world! Way back in Europe's Middle Ages, fishing rights to the oil-rich Atlantic herring created wars, as OPEC oil does today. Herring continued to be essential for centuries longer. Herring were the primary source for oil back in the days before the era of whaling and the petroleum discoveries of the late 19th century. The herring is one of the most important and significant fish species in the world's oceans! Herring have always been the staple food of all the varieties of marine life. Herring are the preferred dinner plate not only for salmon, halibut, cod, red snapper, rock fish and all sorts of spiny sea creatures, but is a staple for all kinds of seabirds as well as for marine mammals such as seals, otters, and sea lions. Even whales relish the oily little fish. Herring travel in massive and densely packed schools that make succulent and nourishing dining when scooped up by the great jaws of those behemoths of the oceans. Alaska's herring have been threatened for more than 30 years. When the herring vanish, so does everything else dependent on them! Nature kept the species in balance for eons. Then came Man, and the balance was off. In Alaska, salmon was one of the first species to threaten collapse. There were fishermen in Ketchikan not too long ago who remembered J.R. Heckman in 1929 saying about the previous bumper crops of salmon: "This is about it, boys." But no one knew it for sure at the time ­ that the salmon stocks were headed for serious depletion. But by the time of Statehood in 1959, it was obvious to anyone that Alaska's salmon stocks had been fished almost to the brink of extinction. Among the reasons? Possibly it was fish traps. And the political tug-of-war between revenue-producing canneries and the health of the marine resources. At Statehood, fish traps were abolished and the biologists of the new State of Alaska Fish and Game Department began the work of bringing the salmon stocks back - a centuries-long task that had begun to show documented, positive results even before the turn of the 21st century. But herring were another completely different kettle of fish. Even after the decline of the salmon, somehow the herring stocks remained in good shape for many more years, until their own rapid collapse in recent memory. Possibly the loss of Southeastern's great herring schools and the present worry about the small size of today's herring was caused by natural marine cycles? Or maybe ­ as many suspect - it was caused by the relatively recent too-heavy herring sac roe harvest for the Asian markets? The herring of West Behm Canal, just off Clover Pass, are just now gaining numbers in a slow comeback The present local concern for the specie is because the slowly returning herring stocks of West Behm Canal, off Clover Pass, are now scheduled for a sac roe harvest in just weeks. The Fisheries Board made the decision, the Governor's office has stood behind that decision in spite of local protests. West Behm Canal is just one of Ketchikan's local herring "neighborhoods" and a popular spot for salmon fishing by locals and visitors, too. 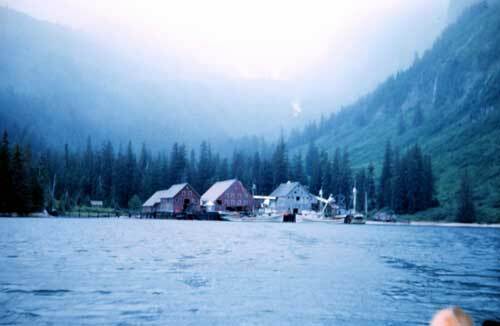 Until the early '70s, Ward Cove was one of the great "herring holes" in the Ketchikan vicinity, in spite of the pulp mill's presence. So was the herring hole off the Coast Guard Base, the site for many years of the city's garbage dump. And so was the one conveniently located off downtown's City Float where Ketchikan Cold Storage slurry as well as bicycles and miscellaneous garbage was dumped for half a century before awareness of the environment enlightened community minds. Herring are sturdy fish in most instances! Each spring the churning herring "boils" were commonplace around the Ketchikan area. Herring are deep water fish and spend the winters at rest in their deep water holes of protected coves and inlets. Each spring, usually sometime in March, they come out of their winter snooze for spring spawning. Each school comes out in one huge body ­ the adults in front and the juveniles trailing behind like a wagging tail. Then they spread out and spawn profusely on shore vegetation, rocks, branches, whatever's handy. Then, always with their pack as if each fish is just a part of a larger fish, they feed until it is time to retire to their winter grounds. Herring are "neighborhood" fish and stay pretty much in one defined region. Herring have the disproportionately big eyes common to deep water fish and they don't like light! Wily seiners who fish bait herring go after their prey on dark, moonless nights. When they near their targeted location, they run without lights. When just at the right place, they cut their engines, wait patiently while a skiff man slips into the water to set the seine. Then, full of fish, the net is pursed, the boats lights come up suddenly, too bright almost for human eyes, and seagulls that seem to come from nowhere scream and squawk as they plunge in for their own feast! Sometimes in earlier years it was possible to see a herring set right in Revilla Channel in town. Ketchikan was then the greatest fishing center on the Pacific Coast. Fishing in Alaska then accounted for 80 percent of all employment with most activity limited to the summer months.Fish & Wildlife Service. 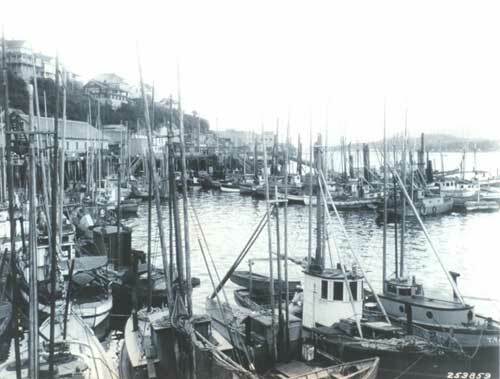 Oldtimers told of other sights along Ketchikan's waterfront when the herring moved out each spring. Up until about 1970, an approximate timeline, the oldtimers told of the slick heads of seals bobbing up along the town's docks as they searched for the best path to their target herring. In spite of boat and float plane traffic, sea lions enjoying their feasts of tasty herring would frolic in the channel and sometimes, in the excitement, their shiny-wet and clumsy bodies thumped atop downtown floats! Gulls squawked and flapped happily as eagles silently wheeled and plummeted with talons extended to carry off their prey. Some of those oldtime Alaskans, during interviews about twelve years ago, shared other memories of what it was like on Ketchikan's waterfront when the taken-for-granted herring were more than plentiful. around here" or buy it at a supermarket, he said. "Hell, you could get herring all winter long! You'd just have to go down to City Float with a herring rake and haul 'em in." 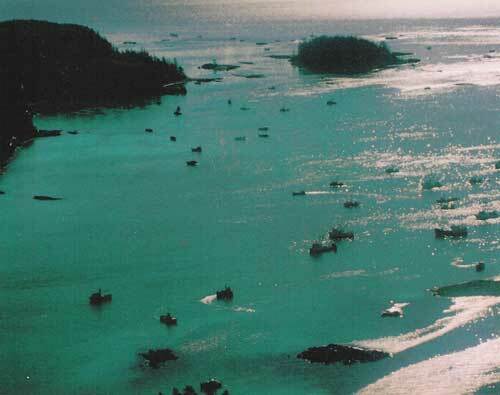 The late Harvey Leask of Metlakatla, longtime highliner and bait herring fisherman, said he always worried that every year bigger quotas were set for fewer herring. "Nobody's giving them a chance to grow and become prime," he warned. And today's herring catches seem to validate his fear ­ the fish are all small, according to reports from today's fishermen. The late Charlie Nelson of Craig and Ketchikan fished bait herring for many years and said in the same interview twelve years ago that his prime worry was the herring sac roe fishing. He added that he understood the Alaska Department of Fish & Game's mandate to get the best money return from a particular fishery like the sac roe harvest, but he thought too small a percentage of those fish's worth stayed in Alaska. Today the herring have become smaller and smaller. According to marine biologists, Pacific herring up to 18 inches have been recorded. But the Alaska herring have become smaller and smaller and now an eight-inch fish is considered "good sized." No one - biologist, politician or fisherman is venturing a guess as to the reason for today's smaller fish. In some ways it seems obvious. Perhaps not. And today the wisdom and safety of the sac roe fishery is repeatedly questioned. There has been the argument that "A dead herring is a dead herring" regardless of the method of its harvest, bait or sac roe. At present, there is also a newer development: Perhaps the sac roe fishery will in time become a thing of the past on its own. Japan long ago fished its own herring populations to extinction. But Japan's older generation is said to be dying off and with it the taste for traditional dishes. The younger generation is said to be more interested in McDonalds and pizza than in Kazunoko, a caviar-like delicacy made from herring roe, ginger root, soy sauce, rice wine and fish stock. Herring never seemed to garner much public interest in their welfare. Maybe it was because their schools always appeared in such big numbers that it seemed there was no end to them. And not everyone enjoyed them as a food fish. There are those old Alaskans who confess they'd rather bury surplus herring in their gardens for their nutrient value. In the earlier mentioned interview, the late Gil McLeod, a white child born in Howkan in 1904, looked back and shook his head over the fate of the lowly herring. He said he believed that the reduction plants of the early 20th century were the beginning of the end for the herring. He referred to the big 75-footer herring boats from California, Monterey in particular, that sailed north each year in their own off-season and, "They fished the herring out!" McLeod said. "Frederick Sound, Chatham Strait, all fished out. When I ran the mail boat I saw all the stink plants [herring reduction plants] in just about every bay and inlet," he said. McLeod recalled that Andy Gunderson was the first person to fish for bait herring for sale, way back when, about the 1920s. That was when the halibut fleet was moving north and settling in Ketchikan. "Halibut was the big money fish at that time and he sold to the halibut fishermen." Craig was the center for fishing then, he recalled, but there just wasn't enough room for the big halibut schooners to tie up at that little town, so everything moved to Ketchikan. And so did Gunderson and McLeod. "Port Alexander" he reminisced, "now that was a big trolling port years ago. Karl Hansen had a busy town there, where trollers went for the bars and dances. Big town, salmon capital of Alaska for awhile. But it died when the herring were gone, caught for the 'stink plants,'" he said. The first herring reduction plant came to Alaska in 1878. In 1882 a stink plant was built at Killisnoo on Chatham Strait. The herring were pressed for oil and the residue used for fertilizer. 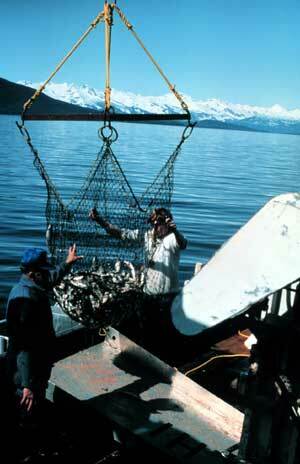 The peak year of herring plants for bait and fertilizer production in Alaska was 1929. It's significant that that was also the year of the beginning of the decline of salmon stocks! The least intrusive and negative part of the herring fishery is the roe on kelp harvest. For centuries past the North Pacific Indians looked forward each year to a tasty springtime treat provided by the uncounted millions of herring eggs spawned on beaches and kelp all along the coastlines, bays and inlets. The various tribes place hemlock branches into the water to catch the spawned eggs - hemlock because the needles are soft. Like the springtime ooligan, the herring roe are as much a tradition and cultural event as a food. Like ooligan, it is also a cultural coming together, a time when everyone is eating the same food at the same time. A newsworthy fish, it seems, the big-eyed little herring. The Governor's office said recently that the West Behm Canal sac roe fishery will go on as scheduled. But, actually, the Governor himself didn't say so. His spokesperson was quoted as saying, "[The Governor] has no plans at this time to stop a commercial sac roe fishery from occurring." off Clover pass. Do you suppose those plans could change with input from the public?